Viewed through the idea that it's a standalone expansion to Sid Meier's Civilization 5, Sid Meier's Civilization: Beyond Earth streamlines gameplay in the long-running strategy series to enhance the pace of the historically-strapped franchise. As a spiritual successor to Sid Meier's Alpha Centauri, however, it's a cut-rate disappointment. Beyond Earth is best described as an epilogue to the events of Civilization 5. Humanity has ruined the planet and must commit itself to starting all over again on another rock and potentially making the same mistakes. And so, various nations make conglomerate factions and shoot for another spherical mass to strategically explore, expand, exploit and exterminate (4X) one another. Why I wish Firaxis had never mentioned Beyond Earth as a spiritual successor to Alpha Centauri is that this game doesn't look like it was given the financial resources to kick off a new franchise. It feels like it had the budget of a Civ 5 expansion, where asset creation went into making a visually interesting game world, but not its overall presentation. The characters are painfully dull and inarticulate. The tech and wonder voiceovers are all done by one person, but in many cases are attributed to faction leaders within the game (who do have their own voices). The experience doesn't feel luxe. Firaxis has been the benchmark in accessible strategy games and it's owned by triple-A publisher Take-Two Interactive, but I've seen stronger production values from independent European competitors. The premise of Beyond Earth is still fun and there are a lot of core ideas going on that strategy fans, especially Civilization veterans, will be able to immediately digest. The game launches with your faction landing on a fresh new world. It'll be important to decide early on your people's affinity, a new mechanic to the series that represents the long-term evolution of your society. Will you live as one with the planet in "harmony," create a tech-hybrid with "supremacy," or focus on remaining human with "purity?" Each imbues its own perks that'll dictate the play style to victory. Without the shackles of history tying technology and its logical progression down, Beyond Earth gets to the good stuff fast. Players will have access to oceanic travel, trade, diplomatic options and covert ops in, potentially, less than an hour. 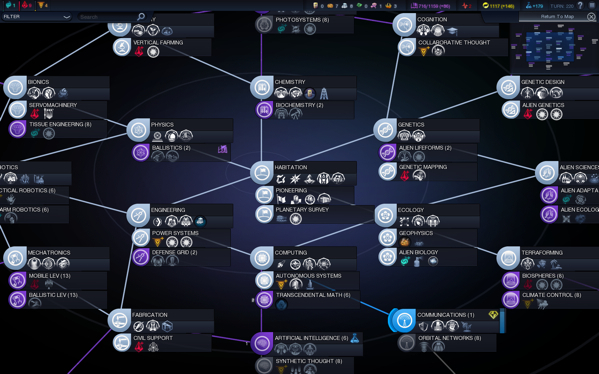 Affinity will be leveled up through the game's tech web, which can be daunting to understand at first (use those filters in the top left! ), along with decisions made through the game's quest system. The quest system is where Beyond Earth clearly needed more time in production to accessorize. Everything is presented in text. Text, text, text. Even this review tosses some imagery between paragraphs. Not only is there a lack of visuals to spice up your binary decisions for quest outcomes, but understanding that you should be checking the quest logs for stuff to do next is not intuitive. All of this is explained by leaving the game's tutorial adviser on. Being pulled out of the game for another tutorial is not a fun way to learn, but it covers a lot of new ground. Speaking of things that aren't intuitive, let's get Beyond Earth's aliens out of the way, which one might infer are tantamount to Civilization's barbarians. If you are a Civilization player, understand this: Aliens are not barbarians. The game will become a painfully frustrating experience if you treat them as such and hostilities will escalate quickly. Aliens will swarm like a faction taking out units and you'll get nothing accomplished. I attempted to be one with the planet in harmony during my first half-dozen attempts at the game, but then I discovered the perk that gives a science bonus for every alien kill and the path of Purity was far more fruitful. The only good bug is a dead bug. This may not be the case for all players, so really take the time to understand the aliens in Beyond Earth, because there's a bit of a learning curve to them. Thankfully, not much effort will need to go into understanding the game's military units. As affinity levels increase, so do troops. All at once! No need to spend money (energy) on upgrades over time. The affinity upgrades also bestow particular perks like increased movement of siege bonuses. Units can also earn experience by fighting, which is also quite straightforward, with the option to heal or flatly increase damage if they survive. It's another lovely macromanagement departure from the Civ series. Civilization's city-states have been replaced by stations in Beyond Earth. To pick up the game's pace, they work merely as trading partners, with some quests attached to them. There is no option to announce a station is under your protection, so it's possible for a trading partner (and an associated quest) to just disappear. The game's economy is strongly based on creating trade routes early on and enhancing those routes through the creation of more cities and specific selections in the game's virtue trees. Firaxis previously stated it wanted Beyond Earth to move away from Alpha Centauri's ideology-based factions dictating gameplay. Tropes exist for a reason and by not utilizing them to set and enhance the scene with characters like the ecologist, communist, religious zealot, bureaucrat, etc., we are left with some of the most boring faction leaders I've ever experienced in a strategy game. Because each has a pseudo-national origin, there is an awkward level of restraint, and having no background art to enhance their identity does no favors. Beyond Earth had an opportunity to create outrageous or intense adversaries without the potential backlash of tying them to a cultural identity. More bizarre is that each faction leader has really interesting academic quotes attributed to them upon the discovery of certain tech. However, the leader doesn't read the quote in voiceover to give your interactions with them some (although entirely passive) character development. Even accomplishing one of the game's wonders is a visually unsatisfying affair, also utilizing the same voiceover artist as everything else. This is a massive departure from Alpha Centauri, where each leader had a voice and personality. Beyond Earth's design distinguishes itself because rather than having the multiple layers of micromanagement that Civilization typically introduces over hundreds of turns (with some of them frustratingly late in the game to incorporate), Beyond Earth offers a full tool chest nice and early. The focus of this Civilization game remains the big picture, with tweaks to balance your society delivered through completing quests. Every dozen turns or so a quest will complete or a structure will present a choice that in turn presents a bonus that helps keep the society on a growth path, making the game feel more vibrant and immediate. By paying attention, it's possible to avoid the Civilization pitfall of being horribly deficient in scientific, cultural or financial resources. Beyond Earth is Civilization on rocket fuel. 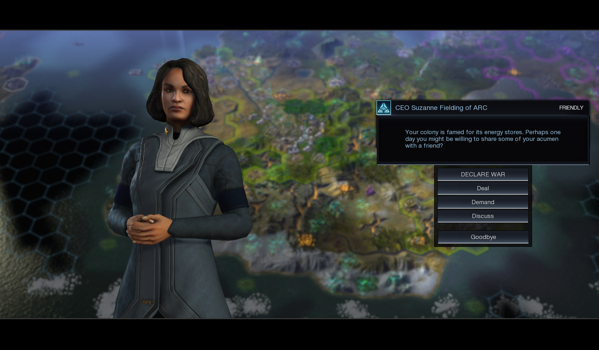 Civilization: Beyond Earth is a good game in the context of the Civilization franchise. It moves to the interesting mechanics faster than any entry in the series to date and everything within the game world looks great. A lot of time went into making the new planet pop visually, if only so much care had gone into the presentation around it. This review is based on an approved Steam download of the PC version of Sid Meier's Civilization: Beyond Earth, provided by 2K Games. Images: 2K Games.